Showing results for tags 'godmother'. This is pretty terry towel made in bright color scheme. 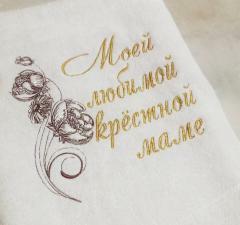 Embroidery sample chosen for its decoration as very suitable for this work piece. 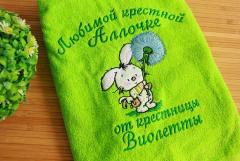 It is Bunny with dandelion embroidery design. It is portrait of little funny rabbit in beginning of summer. It keeps giant dandelion in its paws. It seems that big flower is able to carry this bunny high into the sky.